The coming together of baritone saxophone aces Kjetil Møster and Mats Gustafsson has created an astonishing collaboration. They have been joined by powerhouse drummer Greg Saunier (Deerhoof) and the amazing experimental singer Sofia Jernberg. To complete the line up Kjetil and Mats convinced Anders Hana to pick up his guitar again, with wonderful effect, after he stopped playing seven years ago. The album was recorded in January this year at Duper Studios, Bergen and mastered by Jørgen Træen, who also mixed with assistance from Kjetil and Anders during February. The End have brought together jazz, noise and alt rock, blended to create something new, the double baritone sax onslaught, along with Hana’s baritone guitar, provides a low end sonic assault on the senses. Added to this is Saunier’s inspired drumming along with Sofia’s wide ranging vocals, giving us an album which is not for the feint hearted, an experiment in sound which pushes the boundaries of music. The album does need some time invested in it, enabling the listener to get past the initial shock/surprise of the musical style, each listen revealing more of the intriguing contributions of each player and the adventurous direction of the music, all linked with that “wow” factor over what they achieve. 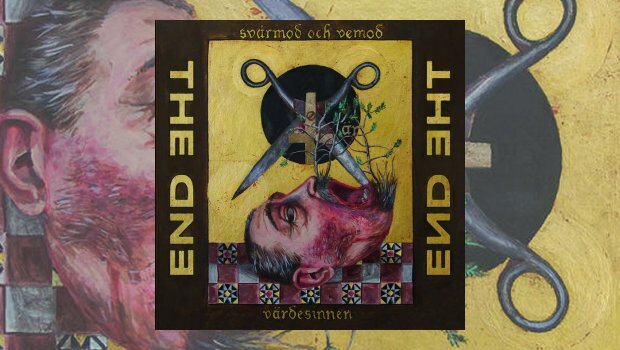 The opening track Svårmod begins with a hard distorted guitar, when the drums and two impressive baritone saxophones come in the song moves forward a pace in what is a somewhat dark opener. Vemod follows and offers something lighter and brighter, Sophia’s vocals drifting in and around the music in a wordless and free spirited way. This leads into the first of the two fourteen minute tracks, but it has not prepared you for what is to come. Translated Slaughter starts with Sophia’s whispered offering of the cryptic lyrics, with occasional drum sticks here and there, other instruments adding elements to the sonic texture of the sound, sometimes reminiscent of Frank Zappa. Sophia’s vocals continue to be whispered, at times hissed, sometimes delivered in an almost deranged way, but they are nothing short of astonishing. The song develops and builds toward a climax, but then falls back to a gentler ending with the saxophones. The saxes continue their prominence into the next song, Don’t Wait, Sophia continuing her delivery style of Gustafsson’s cryptic lyrics; the instruments fold around her vocals, gaining intensity and giving an impression of improvisation. Nothing can be further from the truth, this is a cleverly and carefully constructed sonic assault with catchy under melodies. The short 55 second track Rich and Poor is a different experiment in sound, creating a collage of textures, at times unsettling but totally intriguing, this segues into the final track which continues the experimentation but with more direction. Here the vocals at times appear to be matching or competing with the saxes, to the point where you need to listen carefully to identify them. At first this album can be a challenging listen, but it is important to continue with repeated plays, The End have created a bold, adventurous and superbly constructed album. I have been considerably impressed with their musical vision and imagine that in the live setting these tracks could be a great springboard for some amazing improvisation. Available on CD, heavyweight vinyl and download, if you like your music to amaze and challenge you, give it a listen. I’m glad I did.